I've got another St. Patrick's Day craft for you today! 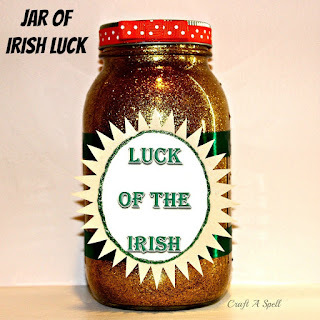 I made a jar filled with the luck of the Irish! I used a canning mason jar that I got from a neighbor. First I coated the jar in Mod Podge. Then I poured gold glitter inside, put the lid on, and shook it vigorously and rolled it around until it seemed like everything was well coated. Next I made three images in Microsoft Word. 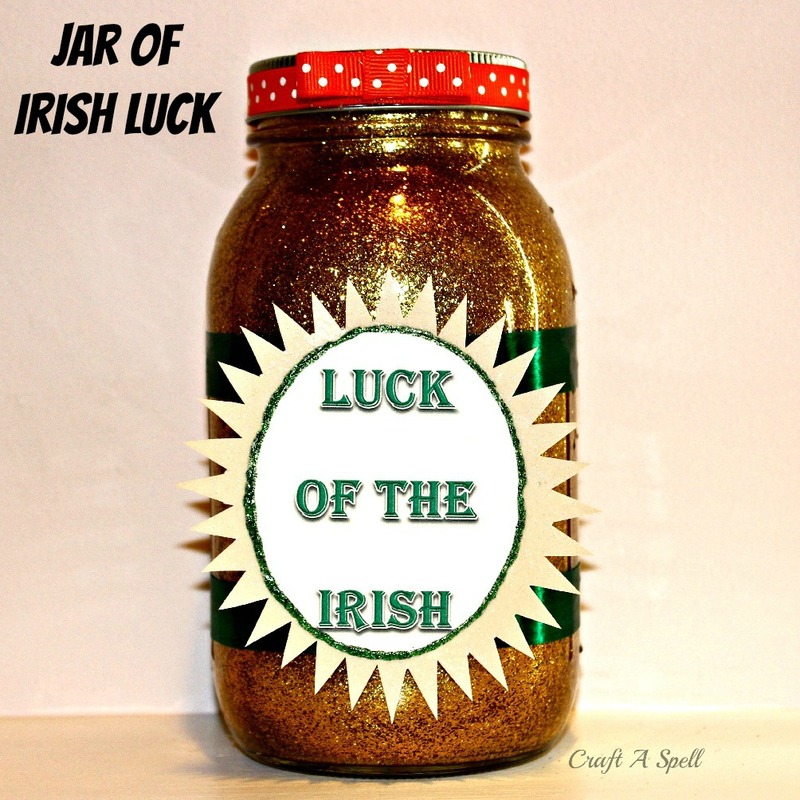 I made two circles and used Word Art to write LUCK OF THE IRISH and CAUTION: MAGICAL CONTENTS (font: Algerian). I printed these out on white card stock. Then I made a thirty two point star and printed it out on regular printer paper. I traced it onto this vanilla glitter card stock and cut that out. 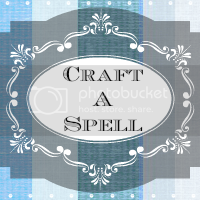 Using Mod Podge, I glued the CAUTION: MAGICAL CONTENTS sign onto the canning lid. It's not entirely centered because I made sure the other part of the lid wouldn't block any of the text so I positioned it differently. 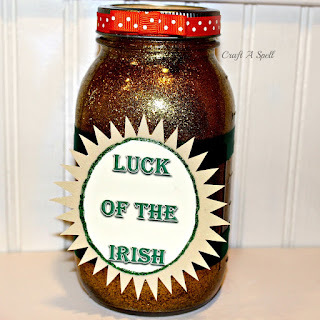 Next, I took two pieces of green ribbon and I used a hot glue gun to affix them to the jar. It didn't have to look pretty because I covered the visible ends where I glued with my sign. 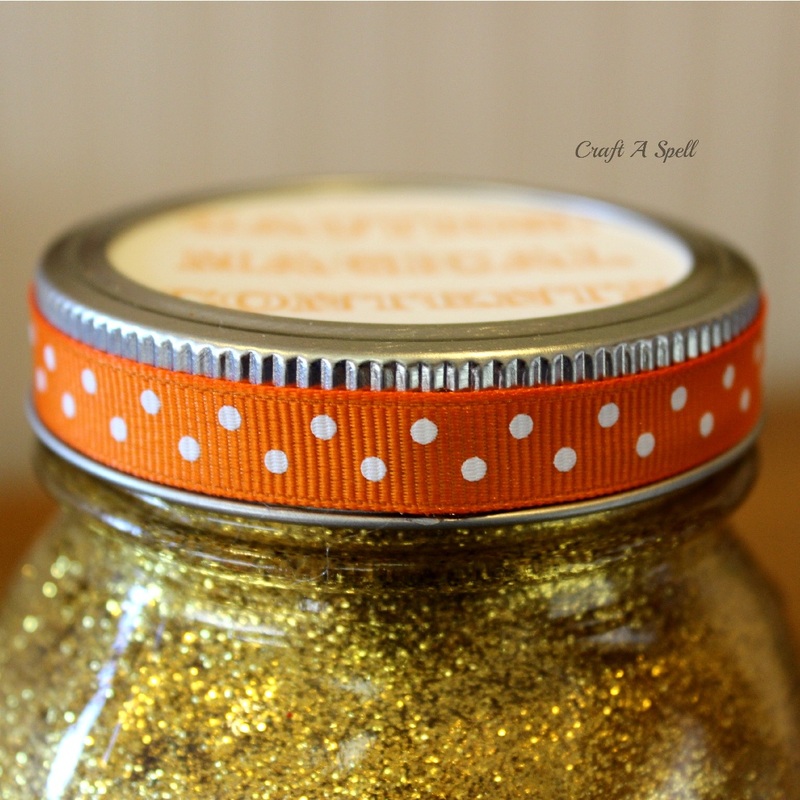 Then, again using hot glue, I put some orange ribbon with white polka dots around the canning lid. I made this little ribbon and glued it on. I did this by taking a piece of ribbon and folding each end in on itself and gluing it. Then I took a second short piece of ribbon and glued it around the first. Lastly, I took my LUCK OF THE IRISH piece and glued it in the center of my glitter star burst using Mod Podge. Then I traced the edge with green glitter glue to hide the difference in the card textures. I stuck this on the jar using hot glue. 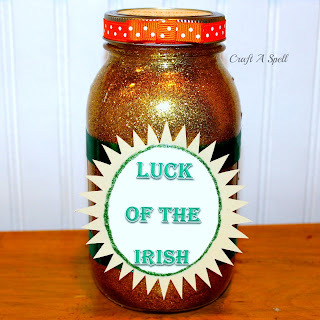 I think it's a cute addition to St. Patrick's Day crafts! 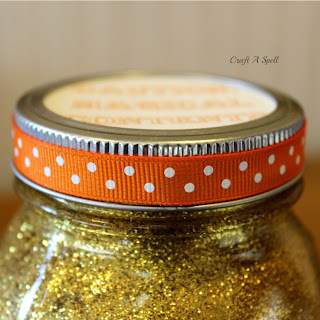 How fun - mason jar AND glitter! 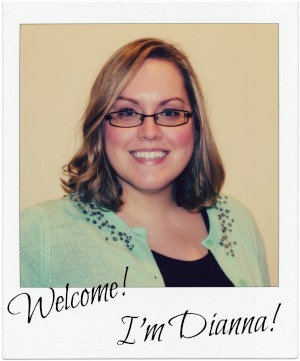 It's an adorable project, Dianna. Love this, such a fun idea. I'm featuring this on my blog. Thanks for linking up!